I think I may be one of the only people who aren't in love with those "Home is where the (insert military branch) sends us" signs. I get that people love them, and that's great...but stylistically they aren't something that appeals to me. I also feel like just because the AF sends us there, it doesn't mean that it will always feel like or become our home. We're the ones who choose to make it a home. I mean New Mexico never felt like home. It was just place we lived. Part of my dislike of them may also have a lot to do with the fact that I don't truly feel like we're military. But that's a whole other story. While I may not be rushing out to buy one of those signs, I do like the idea of having some sort of memento to hang or display from the different states we've lived in (yes even one for New Mexico). 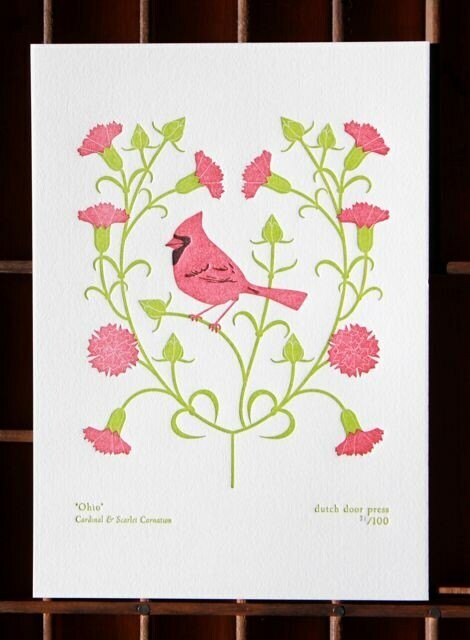 I could never really commit to anything until I stumbled onto Dutch Door Press' Etsy shop. 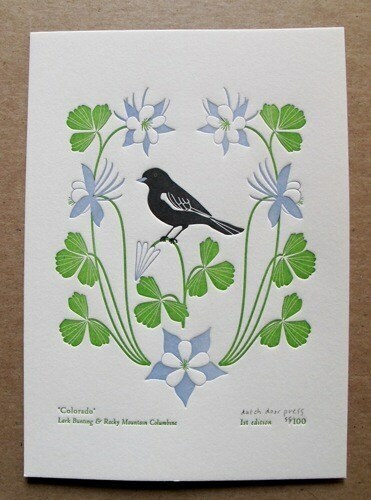 They do letter pressed prints of the birds/flowers of almost every state (of course no New Mexico, but not too shocked there). But...they do have Colorado and Ohio! I love that it's a pretty and smart way to show some love for your state(s)! Plus it's not so in your face. People will have to take the time to look at them to figure out the significance. I already have an email sent to the shop asking about New Mexico, because if they are going to do one for that state then I am going to have to get these! ETA: I just got an email back from the shop and they will be making art for all 50 states. As soon as they have New Mexico ready they will let me know! So keep that in mind if you want one but haven't found your state.